WORK HARD. IT’S WHAT WE DO AND WE DO IT WELL. IT’S NOT AN EASY JOURNEY, BUT WE DON’T DO IT ‘CAUSE IT’S EASY. WE DO IT ‘CAUSE IT’S HARD. LIKE OUR BOUTIQUE BREWERY. IT NEVER QUITS, RUNNING OUT FRESH, NEW BREWS AND HOPPED-UP BEERS. THE BEST IN THE WORLD. AND A CRAFTY KITCHEN. IT NEVER SLEEPS, CREATING HOME-MADE BBQ RUBS AND SMOKEHOUSE MEATS. KISSED BY FLAME AND LICKED BY SMOKE. WE’RE THE HARDEST WORKING BAR IN AUCKLAND, BRED ON BLOOD, SWEAT AND BEERS. WELCOME TO THE SWEAT SHOP. Fantastic way to spend Good Friday!! Good food, awesome service and a nice end to dinner with a few games of pool and table tennis. We’ll be back! Great dinner at Sweat Shop - recommended. Thanks for an awesome night! The service was great, food was good and easy relaxed atmosphere. It was a first visit but definitely not the last. The food and drink at Sweatshop was great. Hi Rose, thank you for the great feedback! We hope to see you again soon. Delivered great service and food was amazing. Brew experience was awesome! Thank you for the positive feedback! I hope we get to see you again soon. Great food, service & live band were amazing as always! We had such an amazing time at Sweat Shop for our after conference function! The atmosphere was great and we were very well taken care of by the fantastic staff. I was worried I hadn't ordered enough food, but there was heaps left over and everyone was so impressed by what they had. Thank you so much for catering to us and helping us have such a successful night! Sweatshop is a fantastic venue! Not only is the space stylish and spacious, but the team there are next to none. 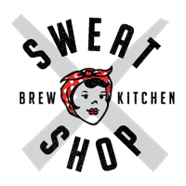 Sweatshop has become our local and I can't see that changing anytime soon. Great Atmosphere to get together and have a great evening. Would most certainly recommend for staff functions. Great staff as well. Great venue and atmosphere for big groups. It was great thanks ! I booked and confirmed my birthday table in January and also called a day before to ensure that all was arranged and I confirmed numbers. When I got to the venue, I was told that there were people still seated at my table and it would take a while to clear the table. I was then told that it was just the indoor area we could sit at which was not ideal and by then, the evening was not looking as great as I had expected from your establishment. The manager finally came out, apologised and gave us a table outside that was cleared but not convenient and nothing was offered complimentary for the inconvenience.. My booking was for 7pm however we were only settled after 7.40pm and my guests were scattered.All in all, we enjoyed the evening because it was my birthday but coming from the service and hospitality industry myself, your service could have been up to standard if your planning and communication was in order. It seemed that your staff had mixed messages about whether my booking was even confirmed. I will say that your bar supervisor was lovely and tried to help, she also created a signature drink for me on the night. The food was great too. (Mostly) great time booking our work event with Sweat Shop last Friday! We had a table all night, with about 25 people there from 6-midnight. Had lots of beer and food, with above average service. However, of course, we came for Beat Council. Great dancing and tunes as expected. At about 1am, a group hug for our departing friend oddly caught the eye of some bouncers who bemoaned our enthusiasm. We were (not-so-nicely) asked to leave, all of us, for reasons unclear. I, the host, asked numerous times for clarification and got none. We're it not for our preexisting intentions to leave, I would have been furious. Alas, last time to go to Sweat Shop. Thanks anyway! best venue in the city!!!! Hosted an event on Friday night at Sweatshop, attracting 60+ individuals who were super respectful and stuck to ourselves. Yet the bouncer with the weird chin beard thought it would be cool to harrass some of the group and didn't let a bunch of people in for no reason. The bartending staff were great though, especially the asian bartender, really made the experience better! The squid was not the frshest and didn’t arrive with any garnish/side salad somit looked a bit cheap and nasty. Other than that, great place, awesome staff and fantastic selection of drinks. Great beers! Hi Georgia, thanks for scoring us on the different aspects of our venue! Looks like we did pretty well according to your standards, which we're really glad to hear :) we look forward to hosting you again.